As expected, the updated 2017 GLA gets a price drop compared to the previous model, thanks to the recently implemented GST! 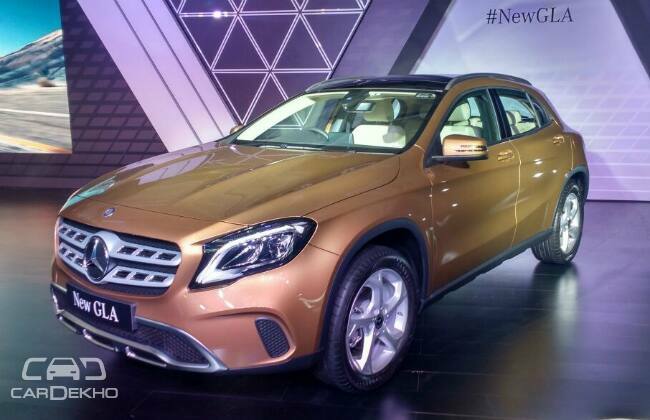 Mercedes-Benz has launched the GLA facelift at Rs 30.65 lakh (ex-showroom, pan India). Compared to the pre-facelift model, which was priced at Rs 33.12 lakh (ex-showroom, New Delhi) and Rs 34.14 lakh (ex-showroom, Mumbai), the facelift gets a noticeable price drop of approximately Rs 3 lakh and Rs 4 lakh, respectively, post-GST. Trivia: The 2017 GLA becomes the first car to be launched after the implementation of the much-awaited GST. Aesthetically, the GLA facelift, which made its debut at the 2017 Detroit Motor Show in January this year, is in line with its hatch and sedan siblings, the A-Class and CLA. Majority of the changes can be seen upfront. The grille has been updated with chrome garnishes on the brushed aluminium slats flanking the Merc logo and now features sharper looking full-LED headlamps (the pre-facelift model featured bi-Xenon units) and subtly redesigned bumper. At the rear, it gets new graphics for the LED tail lamps and a redesigned bumper. On the inside, it features the same dashboard with a different theme and an updated 8-inch infotainment system that now supports Apple CarPlay and Android Auto. Mechanically, the GLA facelift carries forward the same set of engines. The GLA 200 petrol version is powered by a 2.0-litre turbocharged petrol engine which produces 183PS of power and 300Nm of torque. The GLA 200 d offers the 2.1-litre diesel engine that makes 136PS/300Nm (FWD) and 170PS/350Nm (4MATIC - AWD). Both the engines are mated to a 7-speed dual clutch automatic transmission.